Helen Houston, chair of the Moray Firth Partnership, volunteer Pilots Dave Brown, Paul Horth and Marie Stanton, Highland Park, launch the SCRAPbook coastal mapping in Orkney. The Scottish Coastal Rubbish Aerial Photography (SCRAPbook) initiative will take to the skies over the Orkney Islands this week following the successful mapping of the Scottish mainland last year. 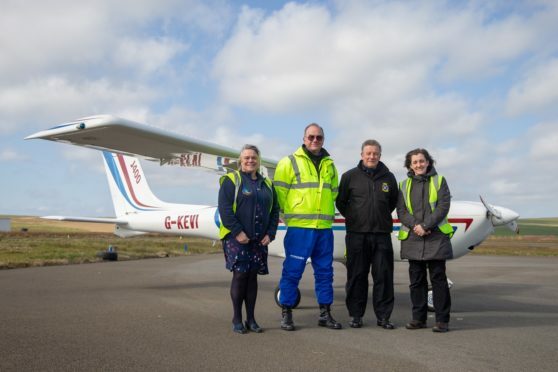 Funding from Orkney distillery Highland Park will see volunteer pilots in a light aircraft to capture extensive and detailed images of pollution around the islands’ coastline. The images will then be classified by volunteers and put onto an online map identifying litter hot spots. This in turn helps direct the community and volunteer efforts to take targeted clean up action. As well as providing funding for SCRAPbook’s Orkney map, employees from Highland Park will be amongst the first to take part in a volunteer clean-up operation when the results are published later in the year. Launched in 2018, SCRAPbook is a project led by two charities the Moray Firth Partnership and Sky Watch UK Civil Air Patrol.